History: The Lamborghini Gallardo LP560-4 is a V10 powered sports car built by Lamborghini from 2003–2013. It is their best-selling model with 14,022 being built throughout its lifetime. 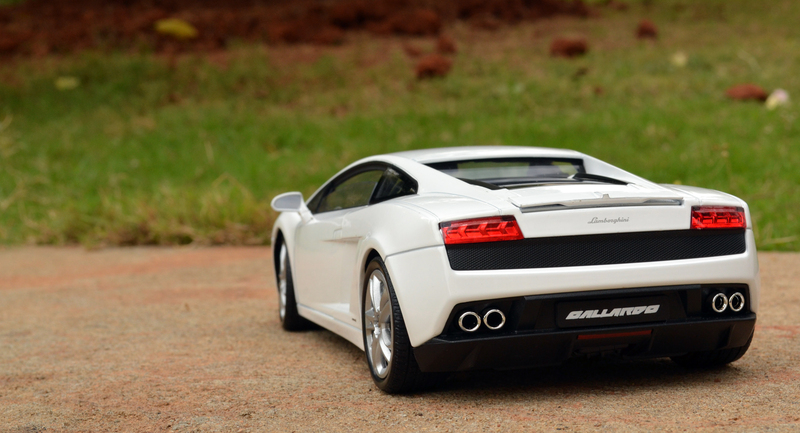 As is the Lamborghini tradition name Gallardo is derived from a famous breed of fighting bull. 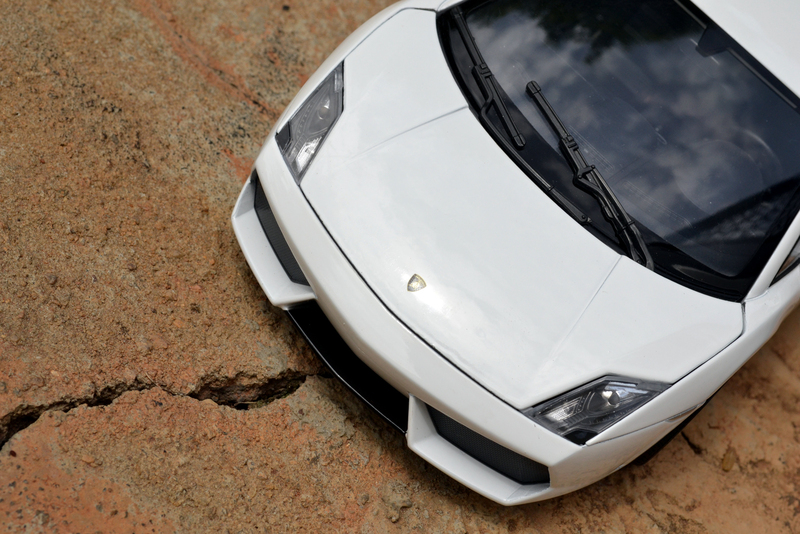 Over the period of ten years Lamborghini introduced some many variant mostly in two body styles i.e. Coupe and Roadster, of which this second generation midlife facelift version that I have here is significant for its styling and its performance. 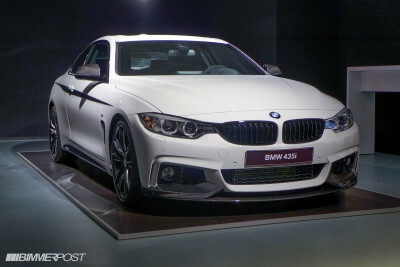 Powered by a new 5.2L V10 engine that produces 560PS at 8,000rpm and 540Nm at 6,500rpm of torque. Featuring “Iniezione Diretta Stratificata” direct fuel injection system to improve efficiency; fuel consumption and CO2 emissions have been reduced by 18% despite the increase in performance. It also has a new design inspired by the Murciélago LP 640 and Reventon. 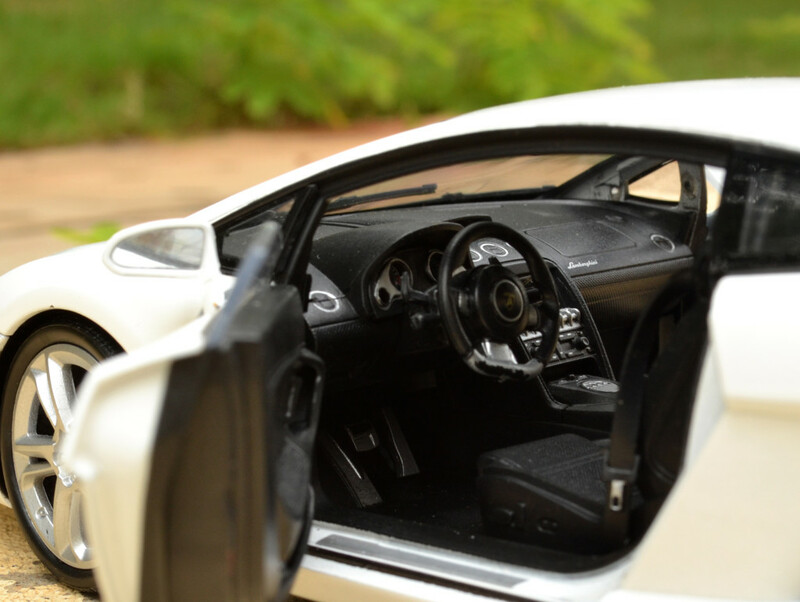 Overview: I have always been a Lamborghini aficionado my entire life for its radical design! 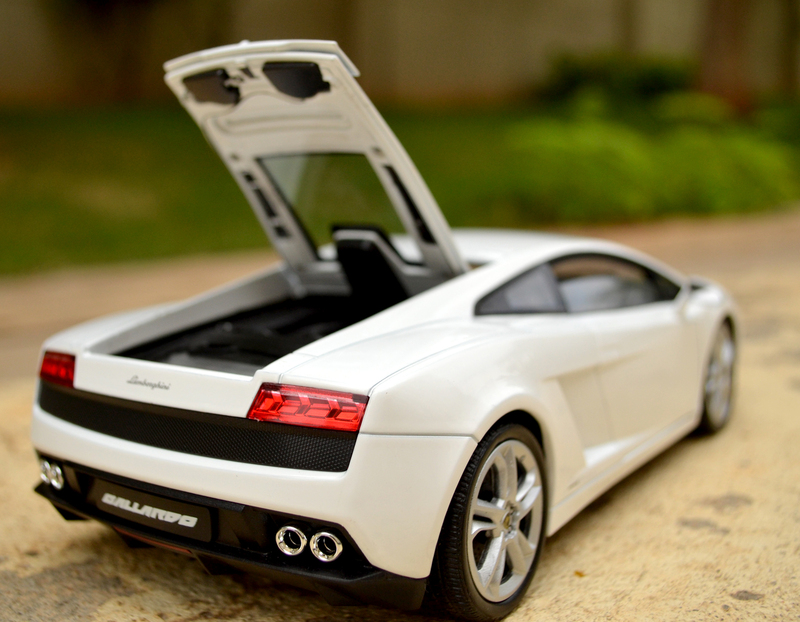 I far as I could remember I had too many Lamborghinis made by Hotwheels in my toddler time. 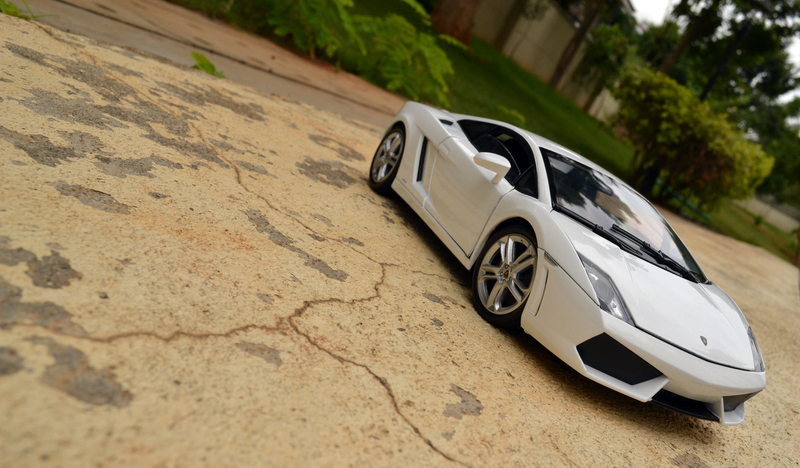 This very Gallardo made by Welly NEX is one of my dream come true!! Why? Because I was waiting and waiting and waiting for this model hit our store in India as importing budgets model like this works out to be very expensive. 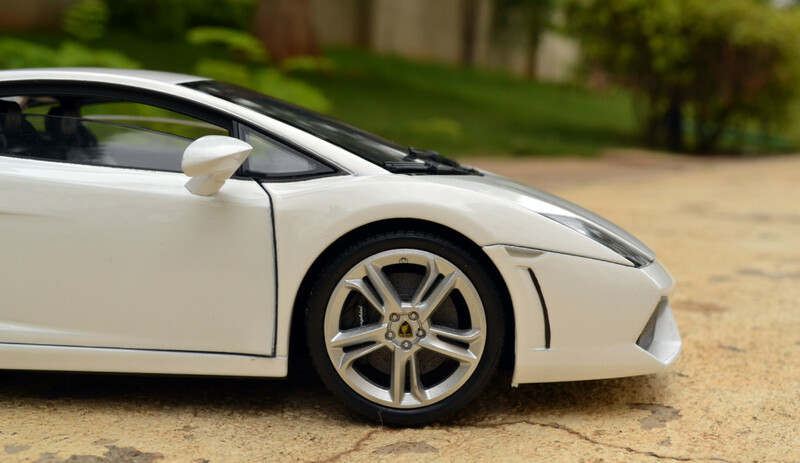 This also is my third Gallardo and I was very excited to receive this pretty bull in white, as I already have an Orange Superleggera made by Maisto and a Yellow Spyder made by Bburago. The headlamp lensing detailing is top class! The LED strip and refelector detailing alone puts this model in a league of its own. Welly also did some fantastic work on the air dam by adding realistic texture. The logo decal also worth a note. Slightly elevate your angle of view a little higher then you would be treated by those massive windshield, which is crystal clear to reveal the interior details. Two interesting addition that I see over the Maisto is the small recess in the windshield for fitting the rear view mirror and the air vents for the defogger, which has a nicer pattern than that of Maisto. 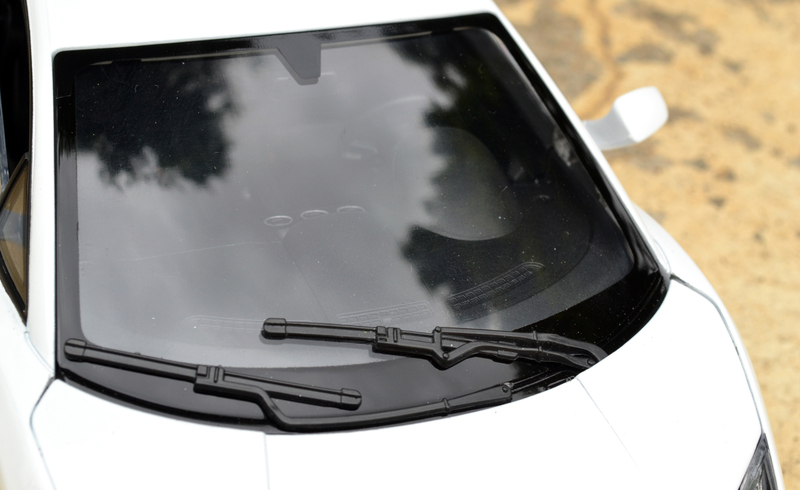 Also the wiper in my opinion is a little to bulky! Profile: Being a NEX edition from Welly the details are impeccable!! There so many interesting bits to talk about, of which the alloy wheels pattern and detailing on the cuts takes the top honours. 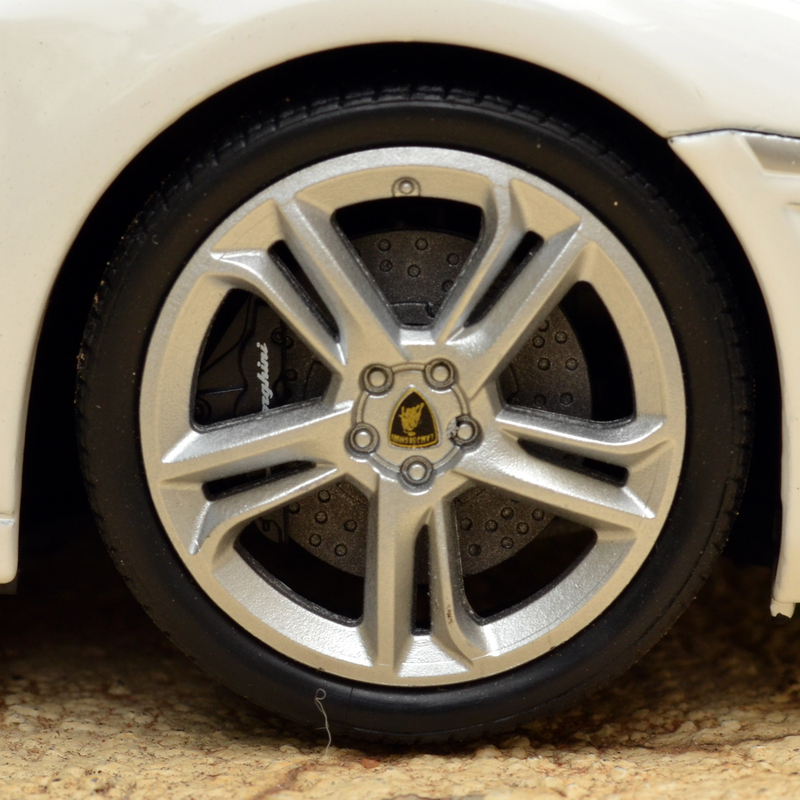 The disc spins with the wheels and the calipers stay as is in the real car And finally those discs look so cool and the calipers looks awesome. Only detail that I would in this disc is the drilling that most other manufacturers like Maisto and Motormax have introduced in their models recently. I will do that in my customization phase. The rubberized tire looks cool and the profile too seems matching with those gorgeous rims. 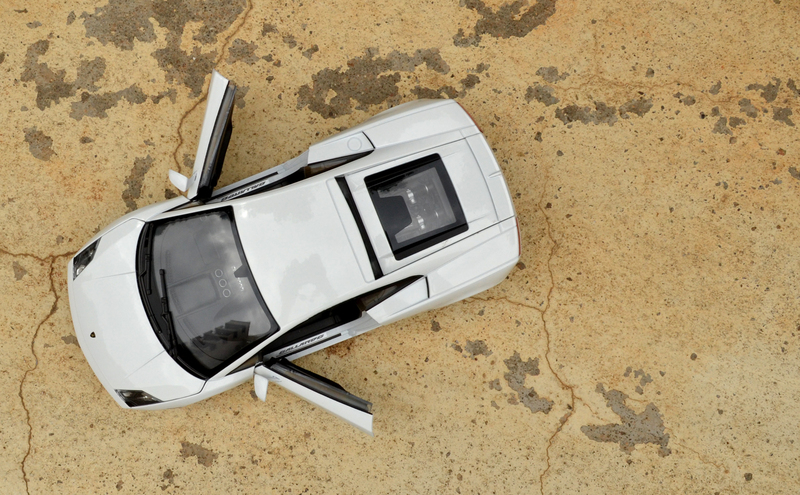 Aerial View: The aerial view just reveals so many details about a car.. The same is applicable to this Lamborghini as well.. here it reveals the attitude and the pure aggression that it intends to pump in. The craked ground pattern addes dramatic appeal to this scale model, taking it a level apart. 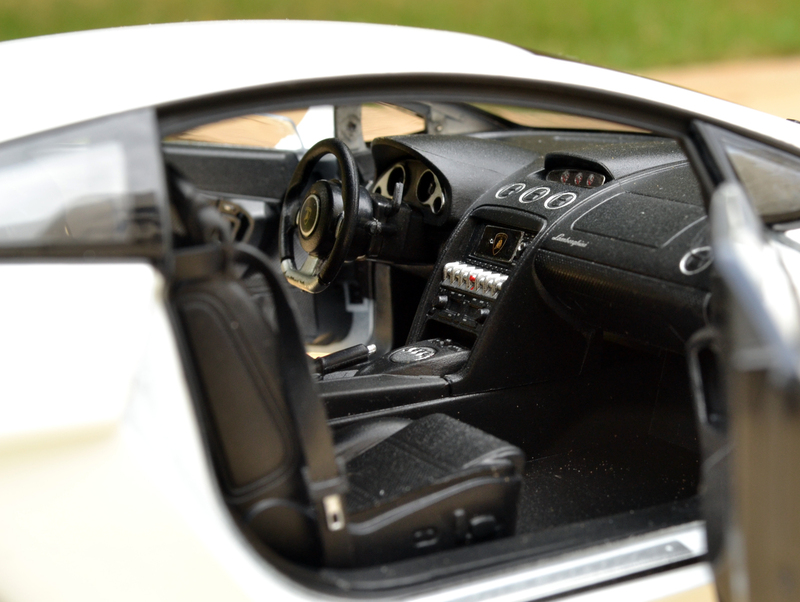 Interiors: The work on the interiors are high end on first look.. the treatment on the gauges are sharp even the pattern is so realistic, the upholstery work is remarkable, the Lamborghini engraving on the passenger is readable (though a little big) and fancy. 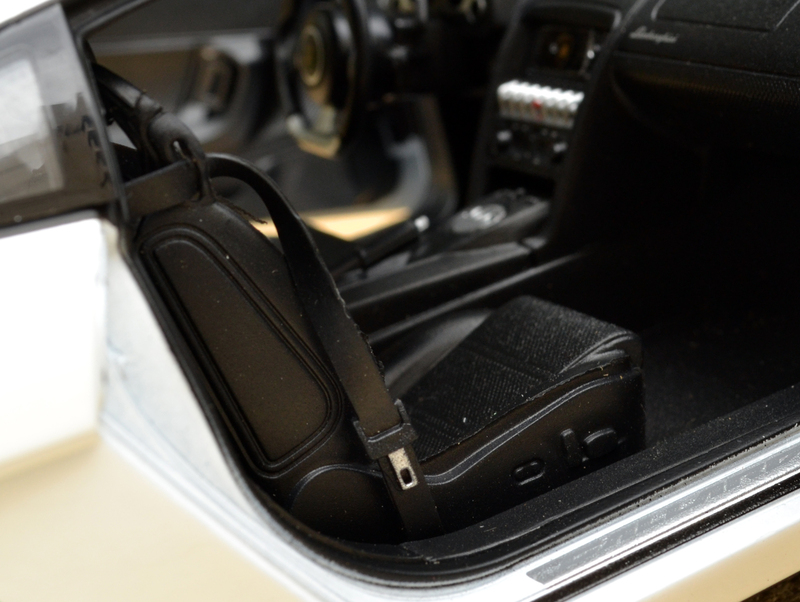 On a closer look the details seem to go north as some of the addition are cool but kill the aspect ration in contrast to the exterior like the seatbelt with its metal buckle look far more bigger that it should be. The steering wheel is surprisingly good both in terms of size and features that it showcases, even the logo is in proper scale. The dash console and center console makes this models interior so upmarket thanks to the usage of multiple color and sharp details like the red hazard rocker. 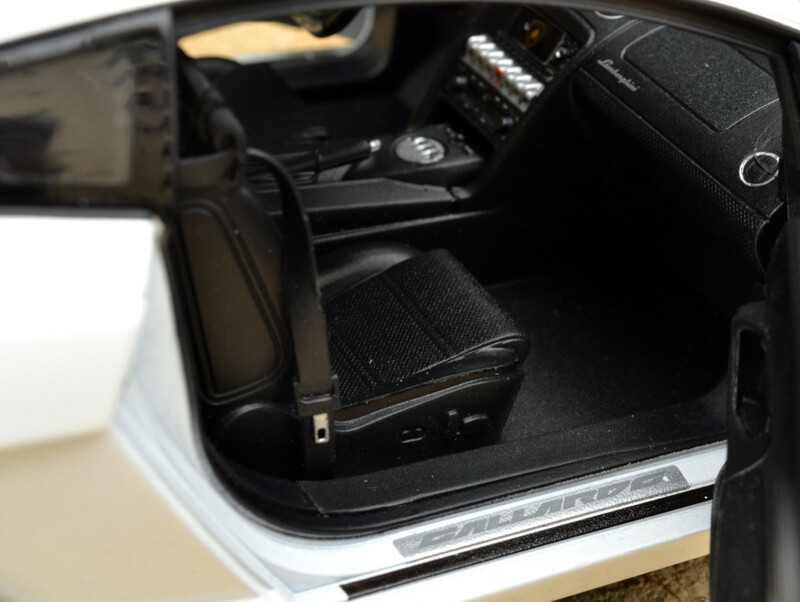 The doorsill with huge “GALLARDO” engraving in it ups the game a little towards Welly NEX. The LED treatment for the rear set of optics is too good in fact so good, I went crazy and shot too many pic of them mesmerized by their shier details. Engine Details: Before even getting there we have to make sure that this is just a budget model from Welly and not an AUTOart of Kyosho, because this guy under the glass hood hosts some serious details. Yes yes its not an AUTOart not even close! 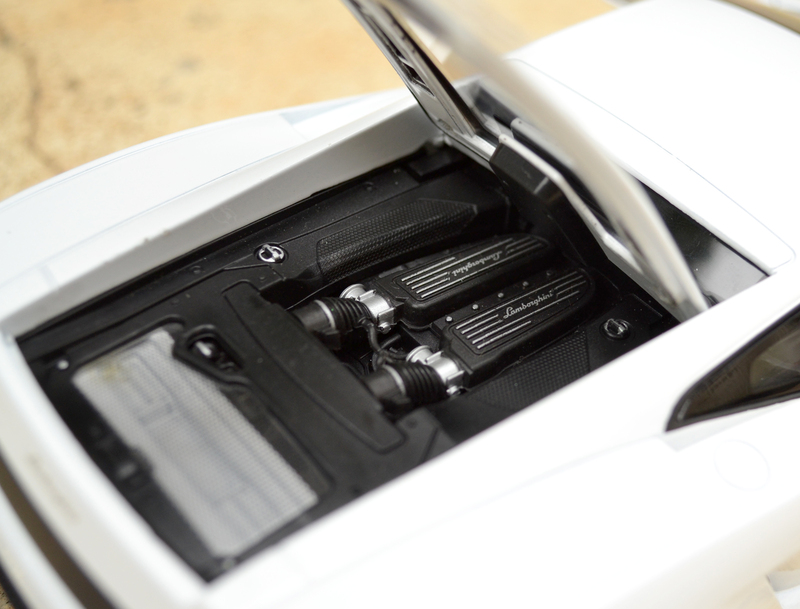 The engine is nicely housed in it bay and the detailing starts from the engine cover that has proud engraving of Lamborghini in light metal/aluminum shade, which is sharp and detailed. There are couple of fluid lids that are also smartly designed and finished in dual color to pop out. I actually compare this with AUTOart for the attention to details in the plumbing department that are top class, in fact the best so far in any budget scale models. 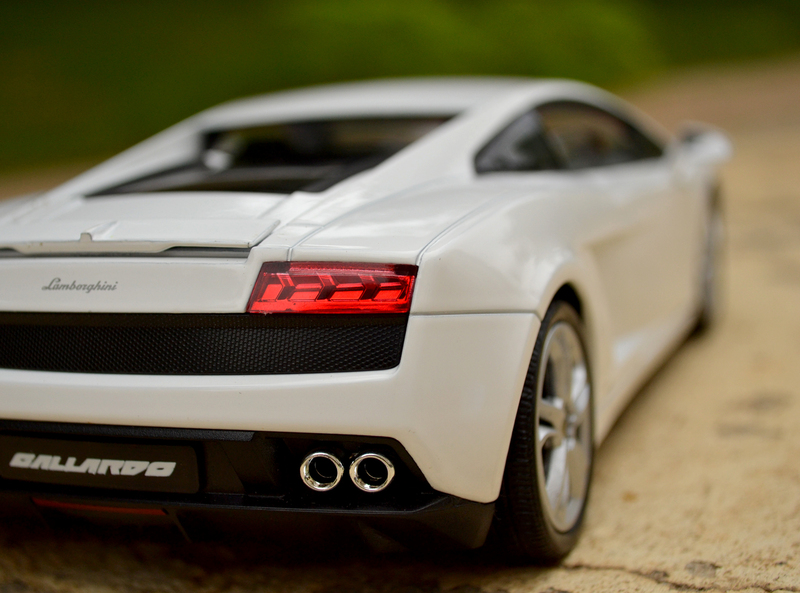 Verdict: This Lamborghini Gallardo LP560-4 is an awesome piece of diecast scale model to own, especially if you don’t have the budget to park all those AUTOart, Kyosho, BBR etc. The details are good, please not they are not excellent! The paint finish is patchy in some areas and I was one of those lucky once to get a model with least number of noticeable defects, that makes this purchase a very good value for money. So xDiecast rating for this model is a 3.5/5. Hope you enjoyed this review… until next time adios! Awesome review as usual 🙂 <3 Gallardo !! Thanks Vicky…. Because it is White the pic have came out well! Nice review.Only thing stopping me from buying this model is the limited color options (available only in white and also black I guess!). 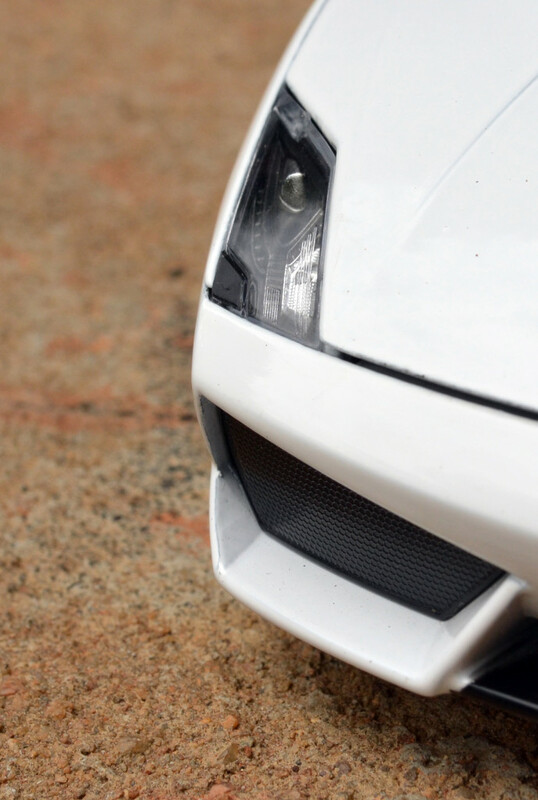 Lamborghini Gallardo is awesome in White!! Also its is available in Yellow(http://www.diecastxchange.com/forum1/topic/54485-welly-gallardo-lp560-4/) and Black as well.. Though Yellow is rare and only white is available in India at this point. Hi Pratip, if you can get them both do it…. They both are very good value for money!! I love them both so much… Which ever your heart desires go for it… If you put me in a situation to pick one and one only, then I would pick the Superleggera for its extra kicks like the extra large spoiler and those massive alloys! 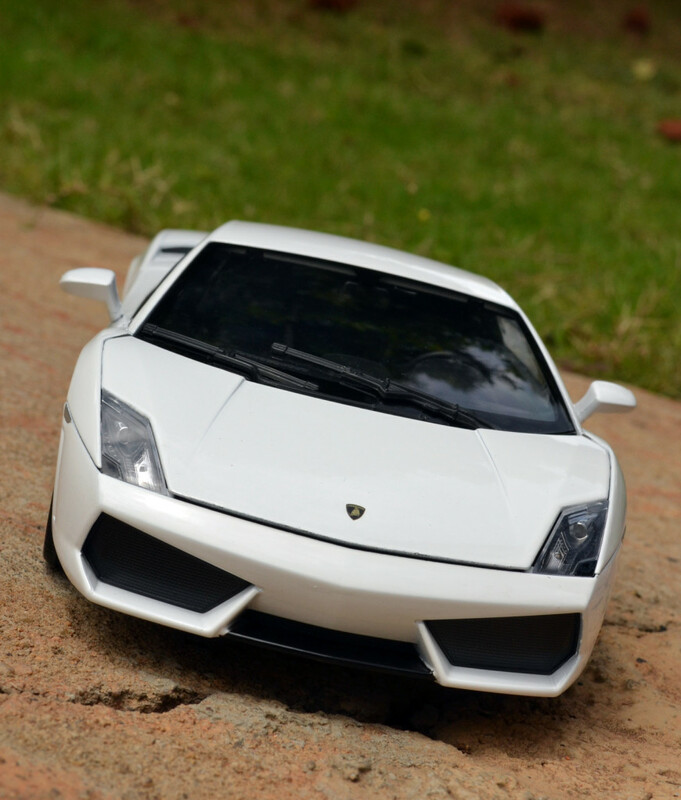 I ownd it… Superb car… Can anyone help me out.. I m luking for 1:18 chevy camaro a.k.a bumble bee in yellow… Maisto made… I did not find it in any indian stores in yellow… Is spending around 2200 bucks worth it???? Yes it’s a very nice bull! Will keep my eyes open for that Camaro and will let you know if I find one. It looks like the doors dont open to the same level. Sad. I dont like Motormax models. They dont look that good. I have bought 2 of this Welly LP560-4, both white originally but now, they are both yellow. I have driven the real LP560 i.e. 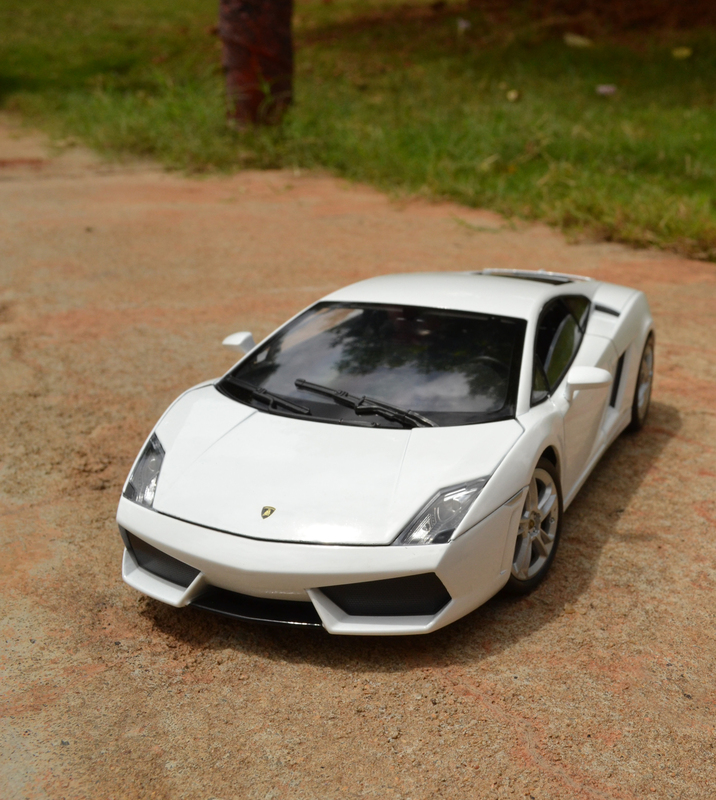 the 1:1 & I wanted a scaled down replica that looks like the one I have driven. Anyway, the smart choice would be the yellow LP560 from AUTOart but I don’t fancy the wheels that AA has chosen for it so I ended up with the Welly because it has the same design of wheels i.e. Apollo. Actually, I also have the AUTOart LP560-4 but in black & black was the only one available then at a low-ish price.